There’s nothing quite like a pool party on a sunny, summer afternoon. Whether it’s a party of one or one hundred, you’re definitely going to need some snacks after you apply that sunscreen. With summer on the brain, and fresh fruit in season, we pulled together our favorite simple, healthy recipes that’ll add a splash of color and flavor to your next gathering. Whip up these easy-to-make, guilt-free treats this weekend and keep everyone pool-ready all day long. Mint adds a surprising, spicy punch to this familiar summer favorite. 1. Cut fruit and mix together in a large bowl with chopped mint. Garnish with mint sprigs. Serving suggestions: add fresh whipped cream or dust with powdered sugar. Sure, firing up the grill and putting some meat on a stick is standard fare for cookouts and pool parties, but why not give the same skewering treatment to fresh fruit? All you need are your favorite fruits, a knife and some wooden skewers! Cut larger fruit into bite-sized pieces slide onto skewers. No need to pay full fare to get a taste of the tropics. This exotic blend of dried fruit and nuts is simpler than apple pie! It’s also great for pool-side noshing because it won’t turn into a puddle if you leave it out. If you’re into this one and want to experiment with it, try this super-deluxe version. 1. Preheat oven to 350°. Line a rimmed baking sheet with parchment paper. 2. In a small saucepan, heat first 4 ingredients (through ginger) over low heat, stirring until smooth. In a large bowl, combine almonds, cashews, and pistachios; add honey mixture and toss to coat. Spread on prepared baking sheet; bake 15-20 minutes, stirring once, until golden brown. Cool on baking sheet. 3. Break cooled nut mixture into pieces; toss in large bowl with coconut, pineapple, and papaya until combined. Store in an airtight container. Makes about 30 ¼-cup servings. 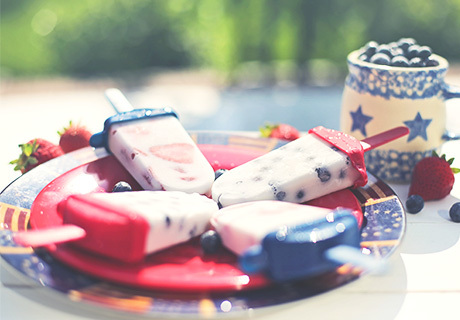 These festive pops are pretty AND nutritious, delivering at least one full serving of fruit. The hostess with the mostess, Martha Stewart, turned us on to these sophisticated yet simple delights. 1. Combine fruit in a mixing bowl, squeeze lime into mixture and let sit for 5 minutes. 2. Spoon into 8 3-ounce popsicle molds. 3. Pour enough juice into each mold to just cover fruit. 4. Insert popsicle sticks and put in freezer. They will be solid in about 6 hours. It’s a time-honored favorite for good reason! Serve in an icy pitcher or pour into popsicle molds and freeze for a tart and icy dessert. Dress it up with raspberries, mint, or strawberries—and if you’re in the mood for an adults-only beverage, add 1 oz vodka per 6oz glass. 1. In a saucepan, combine sugar and 1 cup of water. Bring to a boil and lightly stir until the sugar dissolves. 2. Let liquid cool, turning into simple syrup. 3. Combine syrup with fresh-squeezed lemon juice and 5-6 cups of water. Serve over ice.